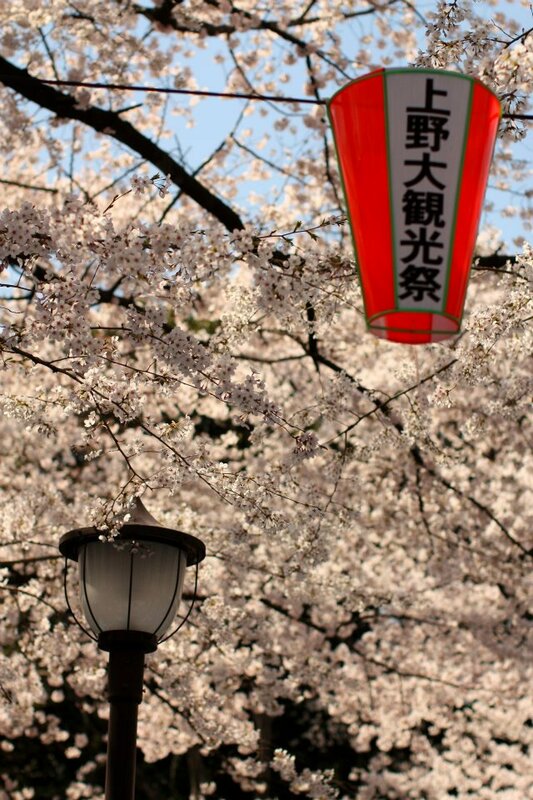 April is the middle of spring in Japan, and this means that cherry blossom season is in full swing. Sakura (桜, さくら or サクラ) is Japanese for cherry blossoms, and they bloom from late March until early May. 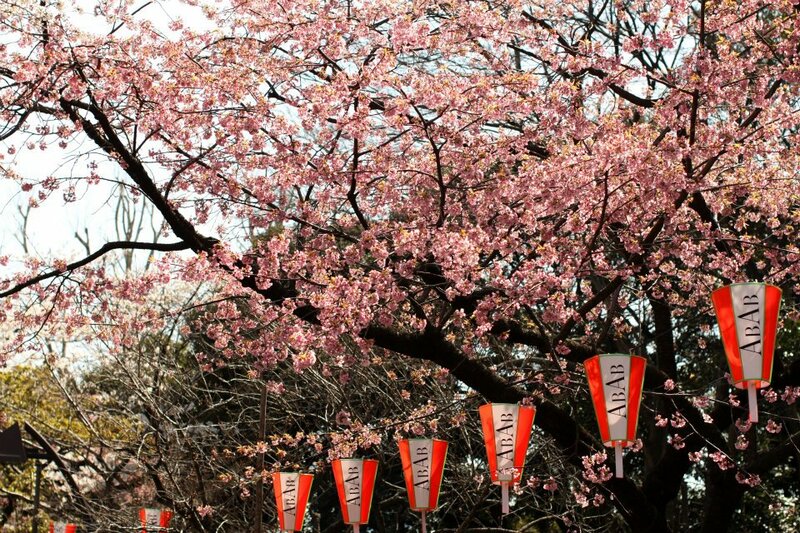 During this time, Japanese locals enjoy hanami (花見) which means “flower viewing”. Hanami can include anything from a stroll through a park with sakura in bloom, to picnics during the day or even at night under the cherry blossom trees. And of course, no celebration would be complete without themed cakes and other goodies! 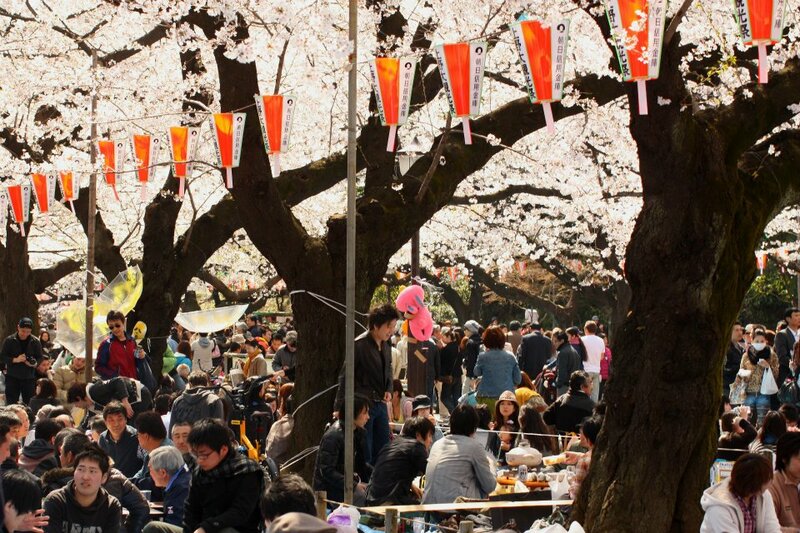 Ueno Park in Tokyo is one of many popular places to enjoy hanami. I went there a few years ago during cherry blossom season, and whilst I was aware that it would be crowded, I wasn’t prepared for exactly how crowded it would turn out to be! What I thought would be a nice stroll through the park – which I’m sure would have only taken a minute or two if there weren’t so many people – was about 30 minutes of shuffling, squeezed in amongst enormous crowds. 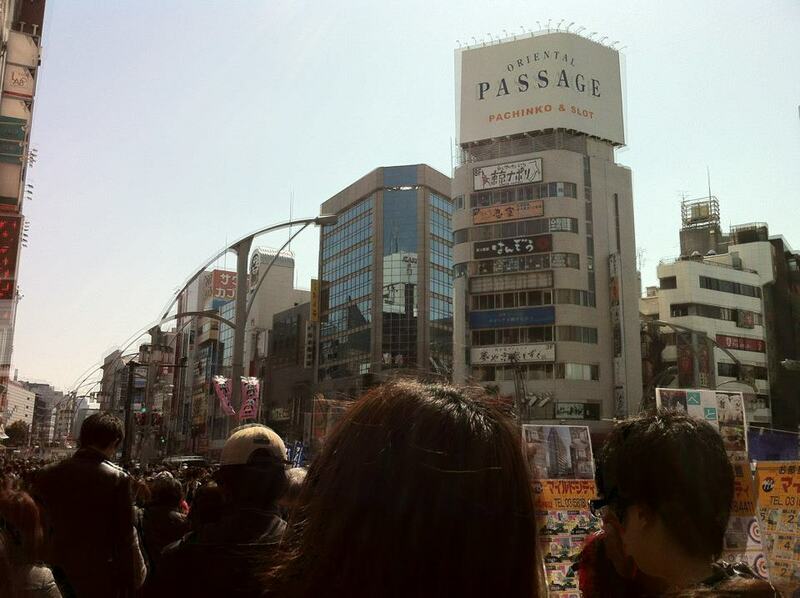 Thank goodness crowds are so orderly and polite in Japan! Those not on foot held hanami picnics under the trees just off the path. Groups of people sat around makeshift tables – cardboard boxes with pots of tea and portable gas cooking appliances – and decorations hung from the trees. 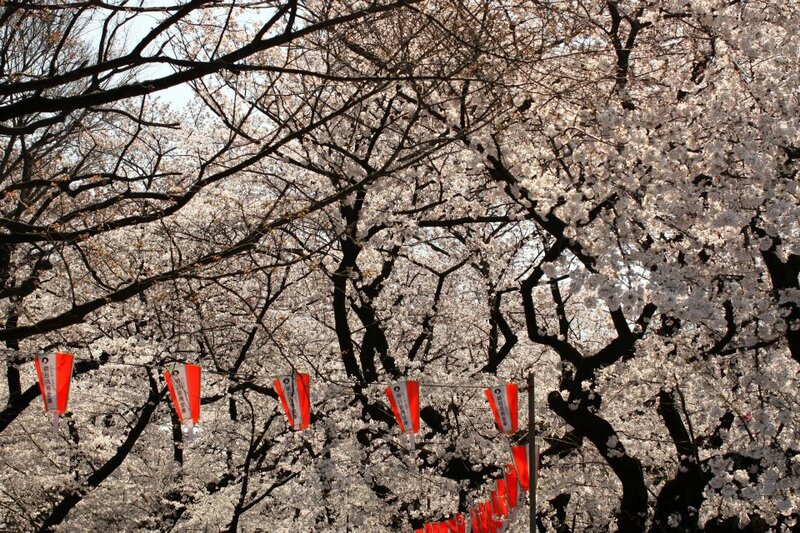 I’ve heard hanami described as the equivalent of NYE in Australia. Instead of camping out to watch the fireworks, people set up picnics to watch the blossoms fall from the trees. One of the great things about hanami is that the attraction is above you, so even when you’re in a crowd, you can still see and enjoy it. All I needed to do was point my camera upwards, and voila – photos of beautiful cherry blossoms, and no sign of the crowds! 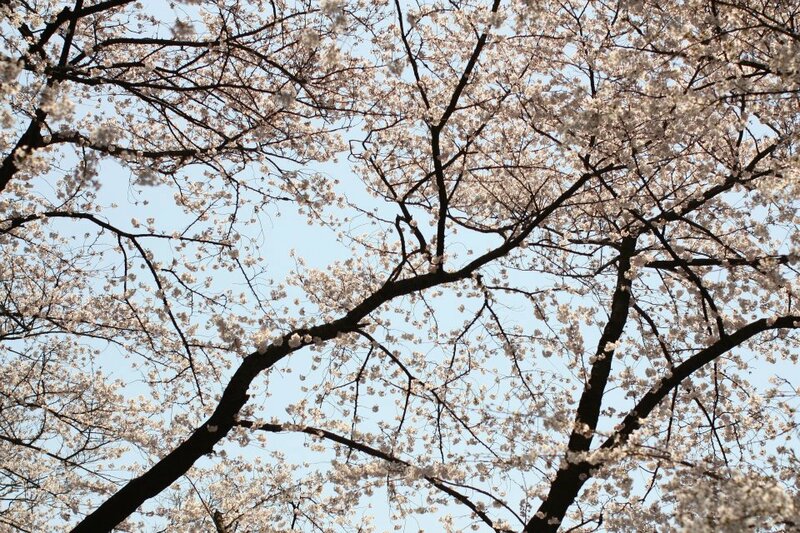 Sakura comes in a few shades, from white, and the softest of pale pinks, to more vibrant pinks. Whatever the colour, it’s beautiful. Sakura doesn’t really have any scent, so although you can buy sakura inspired soaps, candles and cosmetics, don’t be surprised when you reach a park full of cherry blossom trees and you can’t smell anything! 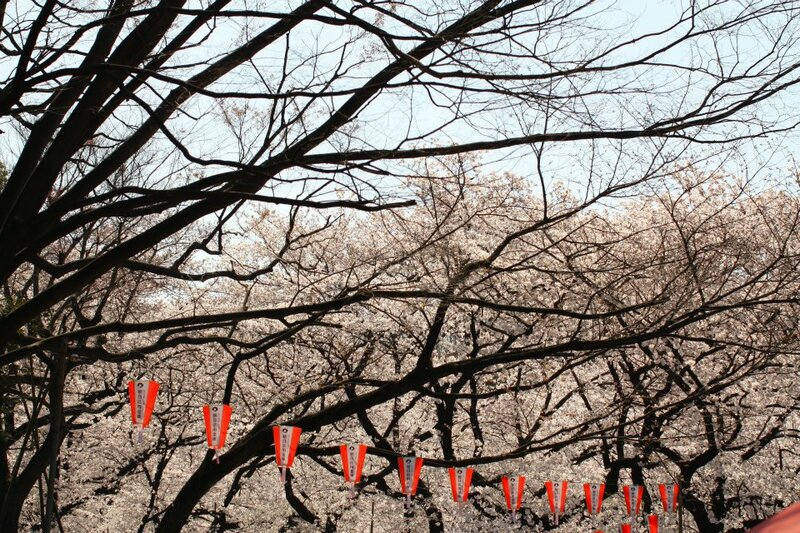 Some locations including Ueno Park are known for stringing paper lanterns between the trees for yozakura (夜桜) which means “night hanami”. The people picnicking under the trees the day I visited Ueno Park seemed fully equipped for a long day of flower viewing, and I’m sure that some of them must have been staying for yozakura. I’m not sure whether this was simply due to hanami, or whether it’s always the case, but the day that I went to hanami, Ueno was extremely crowded. Not just in the park, but also out on the streets. We had trouble finding somewhere that we wanted to eat, and it was hard to move efficiently through the crowds, so we hopped on a train and went to Ginza, where I had a sakura themed cake. Cherry blossom themed treats are everywhere at this time of the year, and this gorgeous sakura themed tart was from a cafe in Ginza called Almond. 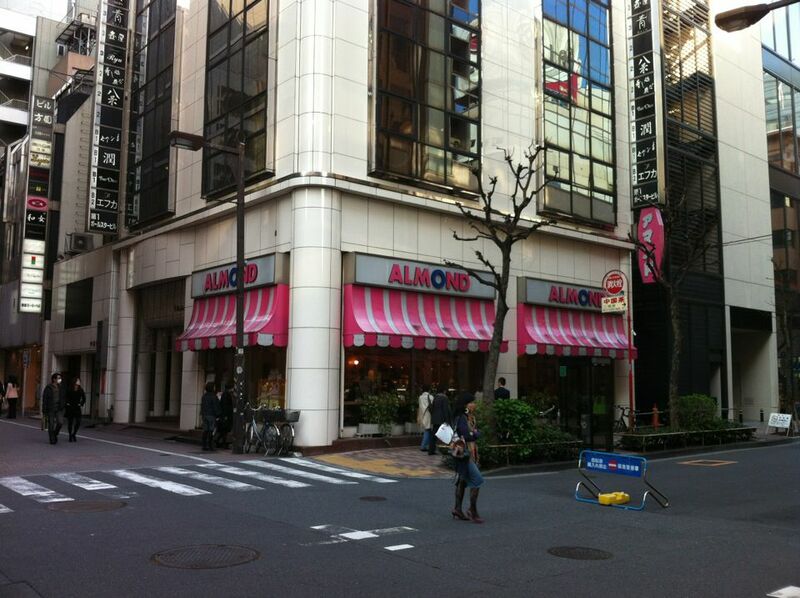 I’m pretty sure I’ve seen other Almond branches around Tokyo. Almond is pretty easy to spot! They had other sakura themed cakes, too. 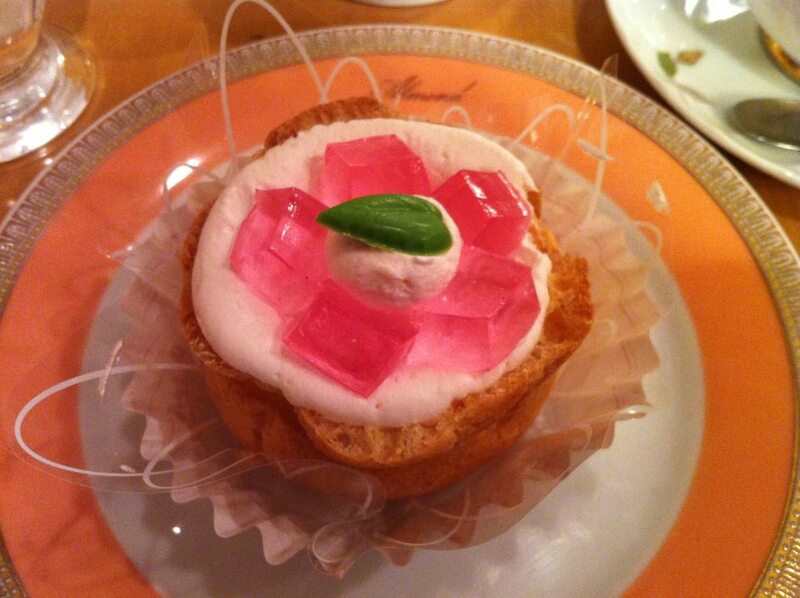 That being said, you don’t even have to go to a cafe to get cherry blossom treats. 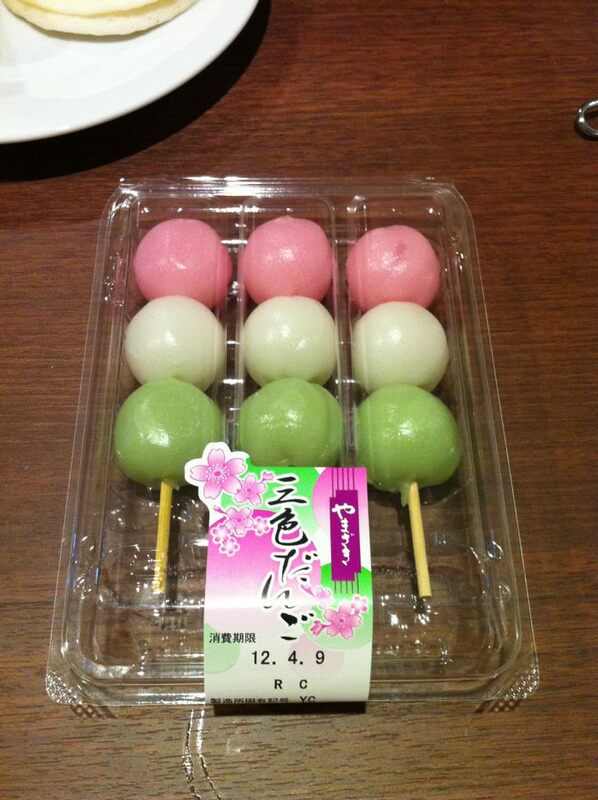 Cakes and other themed food is readily available at train stations, and I bought these sakura themed mochi sticks at a convenience shop. Whilst my favourite time to visit Japan is late October for Halloween, cherry blossom season is probably even more popular. If you’re planning a trip to Japan I would definitely consider going during cherry blossom season.- If you’re like me and find yourself making regular trips to Japan, I recommend that you do make a point of enjoying hanami at least once!